The full VAC Group non-destructive digging service saves you time and money on your project. Starting with our unique, patented unit design, our vehicles are manufactured with state of the art technology that takes more soil or spoil than any other vehicle on the market. Our innovative Soil Transfer system is the first of it's kind in Australia and saves you time and money by reusing the spoil as backfill after it has been processed and cleaned. VAC-U-DIGGA trucks are designed and made in Australia to suit the Australian geography and soil conditions. Contact VAC Group today on 1300 822 834 to hire one of our patented 3000L Vac-U-Digga with one of our professional operators today. With office bases in Brisbane, Gold Coast Gladstone, Sunshine Coast, Adelaide, Sydney and Melbourne, we can service your next vacuum excavation project anywhere in Australia.The 3,000L hydro excavation units are available to hire 24 hours a day and 7 days per week. 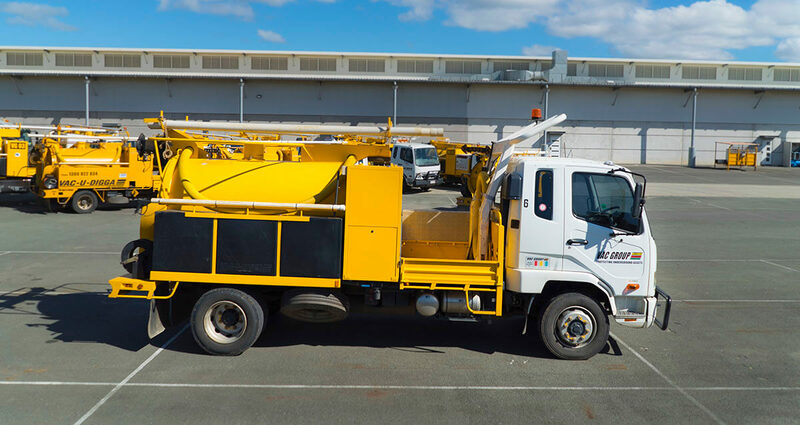 Specifically designed to suit Australian geography and soil conditions, VAC Group's patented 3,000L Vacuum Truck hire utilise high pressure water combined with vacuum technology to safely remove material from and around water, sewerage and gas pipes, telecommunication lines and any other underground assets. Our suction truck provides a safe, efficient and cost effective method of excavating around and exposing subsurface assets with an extremely high level of accuracy and reliability.